The other day, as I was planning out my month of Dutch oven dishes, I had a very clear idea in mind as to what I was going to cook this last Sunday. Very clear, that is, until my wife spoke up. Well, I was more mouse than man. It was an easy choice, really, especially since I was intrigued with the idea, especially of the sauce. I’d never done a Hollandaise. I wasn’t even certain if I’d tasted one before. I wondered about that out loud. Yeah? How do you do it? Oh, no. Nonono. No. This is my chance to learn learn something new and test myself. I’m not going to just “buy a little packet”. It worked out quite well. I did learn a lot about the sauce. One very important thing I learned was that it’s crazy to do a Hollandaise sauce outdoors in a dutch oven in the middle of winter. But, as I said, it all turned out well. I cut the salmon into chunks and put them into a ziptop baggie, along with all the flavorings in the first set of the list. I shook that all up to coat the salmon evenly, and let it sit in the fridge for an hour or so, while I did other things, like making the biscuits. I used just an ordinary biscuit recipe, and added shredded cheddar and minced garlic to the dough. I’ll write it up someday, but for now, my focus is on the other parts of the main dish. I prepared the rice next. I put all of those ingredients into the 10” Dutch oven and put that on the proper number of coals. I watched it while I cooked the salmon and other things, and marked when it boiled. About 10-15 minutes after, I pulled it off the coals, without opening the lid, and let it steep and steam while the other parts of the dish finished. The salmon was the third part to go on. I put a little olive oil in the bottom of my 12” shallow Dutch oven, and set it on the coals. I wanted it to get VERY hot. When I laid the salmon pieces in it, the sizzling and the immediate aroma let me know how good it was going to taste! After a few minutes, when the down side of the fish had a little browning going on, I turned the pieces over with some tongs, and closed up the lid. I had a lot of salmon in the pot, so it wasn’t cooking too fast, even though it was initially quite hot. With the lid on, I put some coals on top just to let it bake a bit. I shook the asparagus in a baggie with the seasonings in its list, and laid them across the top of the salmon pieces, then replaced the lid. Finally, to turn my attention to the Hollandaise. I started by separating the eggs, and putting the yolks in a glass bowl I had pre-fitted to my 8” Dutch oven. I’ll show you how they match up in a minute. Before I began, I put about a cup of water in the Dutch oven and put it on the coals with the lid on. I juiced in the lemon, and I began whisking. I had to whisk for quite a while. It blends, but for a long time it doesn’t really change much, but then suddenly, it goes from a very runny, almost orange, liquid, to a light yellow, thick creamy texture. By then, the water was boiling outside. Here’s where there is a lot of compromise going on. On the one hand, you don’t want it to be too hot, and a vigorous rolling boil is too hot. On the other hand, it’s freezing cold out, and I’ll have to overcome that. I took off the lid and set the glass bowl over the Dutch oven. I had chosen the bowl to cover the dutch oven like a lid, but to not have the bottom rest in the boiling (or simmering) water. I knew that the bowl wouldn’t seal completely, so the boiling water would cool very quickly. With the bowl on the Dutch oven, over the simmering water, I continued whisking, constantly whisking. The idea is to “temper” the egg, that is, to raise the temperature slowly, so that it cooks, but it doesn’t scramble. I poured in the melted butter, gradually, while still whisking. I had no idea how hot it should be, or how it would look. Eventually, however, it did heat up, and it went from a smooth, creamy texture, to a slightly thicker, creamier texture. Along the way I added in the pinch of salt, paprika, and cayenne. 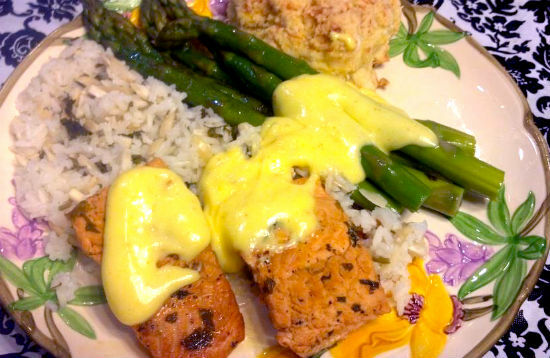 By the time I was done with that, the salmon and asparagus were done, and the rice was waiting for us as well. I spooned out a serving of the rice, and laid the salmon pieces on top of that. The asparagus went to the side, but also still on the rice. Then across it all, I drizzled the Sauce. Finally, the biscuit made the meal complete. Did it work? My wife said that it was better than any restaurant. I love it when she says that! Dutching on the Web: Dutch Oven Solar Cooking? I'm always looking for a new way to cook in a Dutch oven. I was cruising around YouTube tonight and I found this video. I was immediately intrigued by it. He's using a big, square lens to focus the sunlight onto a dutch oven, to cook food in it. When I saw the video, I was immediately skeptical, but also interested. I'm still not convinced just how effective it really is in cooking, but I can see that it can work for some dishes. I think that if I were doing it, I would focus the light mostly on the side of the dutch oven, and I would rotate the oven a quarter turn every ten or fifteen minutes. I also noticed that he used an 8" Dutch oven, which was nice and small. That means less food to heat, and less water to heat up as well. Each time the lid was lifted, it didn't seem like there was boiling going on. Still, it got hot enough to cook the game hen. It would be very interesting to try. Does anyone else reading this have any experience with solar cooking?